This post is a sponsored post written by me on behalf of NJOP. All opinions are 100% mine. This year's Passover falls on the eve of April 14, and in the US, the holiday is celebrated for 8 days. Passover is a celebration of the Israelites freedom from slavery under the pharaoh's rule. A celebration of the exodus of the Israelites from Egypt, through the Sinai dessert, to the holy land, over 3,000 years ago. The custom of eating unleavened bread, Matza, is to commemorate leaving Egypt in a scurry, and not having time to let the bread dough rise. The symbolism and origin of eating coconut macaroons during Passover is one that I am mystified by, but embrace with open arms. Being Indian, I was born to love everything coconut, it's a part of my DNA makeup. Upon further research, seems like the origin of the macaroon is attributed, according to different sources, to either France or Italy. The assumption is that Italian Jews adapted the, what was at the time, almond based macaroon, as a Passover dessert, as it had neither leavening nor flour in it. 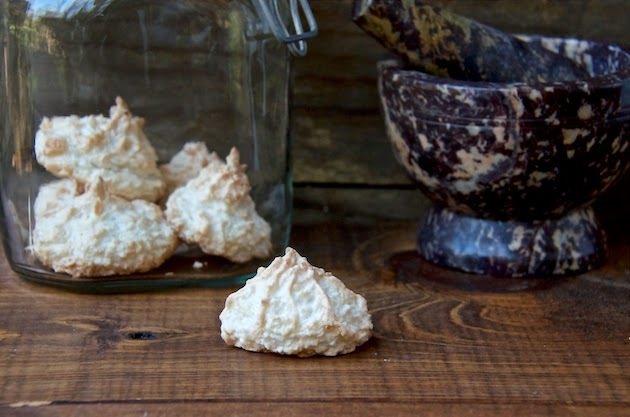 I always wished to share coconut macaroon, a Passover classic, with you, my readers. Each year the holiday would come and long be gone, and yet again I would miss my (wide) window of opportunity. Thank goodness for this opportunity that fell into my lap, otherwise, I might have let yet another window of opportunity bite the dust. The thing with macaroons is, they are simple enough and will be delicious every which way you make them, but...of course there is always a catch...simplicity has to be mastered. I picture that perfect in texture coconut macaroon, fluffy, but not as fluffy and crunchy as a meringue, moist, and not dense. Golden ridges achieved by piping the macaroon rather than scooping with an ice cream scooper. I picture the ultimate macaroon. I hoped my experimentations and results would live up to my imagination, so I played with it a tad. Everything clicked great from the get go and I achieved an incredible classic coconut macaroon here. This super easy recipe can be doubled or tripled. Add the egg whites into a mixer, attached with the whisk attachment, and start whisking on a medium speed (6/10) for approximately 2-3 minutes, until frothy. Add the vanilla and increase speed to medium/high (8/10), add the sugar in 3 batches and continue whisking for a minute longer. Increase speed to highest (10) and continue whisking for a minute until reaching a soft peak. Entire whisking process takes 5 minutes total. Turn mixer off. Pre-heat oven to 350F. Line a cookie sheet with parchment paper. Remove the whisk attachment and attach the paddle attachment. Turn the mixer on low/medium speed (4-5/10), add the coconut in three batches into the softly peaked egg whites and mix for less than a minute, until completely incorporated into the egg whites. Scoop, with a small ice cream scoop, between 12-14 macaroons onto the cookie sheet. Alternatively, you can pipe the macaroon on the parchment papered cookie sheet with a pastry bag, with a large star tip attached. Pipe an inch above the cookie sheet. Bake for 12 minutes or until lightly golden. Watch macaroons as oven temperatures vary and you might need to adjust baking time accordingly. When coming out of the oven the macaroons will still be soft. Let the macaroon completely cool down, settle and firm up, at room temperature, before removing them gently from parchment paper. Keep in an air tight container, once completely cooled down. Best consumed within three days. 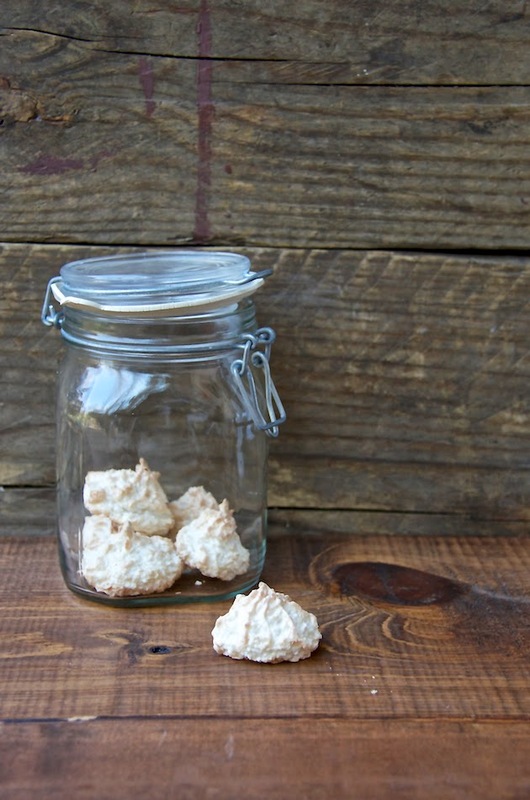 Keep in mind humidity and kitchen warmth can affect Coconut Macaroon meringues piping and baking. Thanks NJOP for sponsoring this post. If you would like to learn more here are a couple more links: Passover Essentials and Juicy Bits of Judaism. You can also follow Jewish Tweets on Twitter for more tidbits, recipes and information. Beautiful macaroons! Perfect with a cup of coffee. I love macaroons, this recipe sounds tasty! I love how cute they came out, they look perfection in bite sized form! Makes 12-14. So serves 1, right? Me. HA. I love coconut to the moon and back! These are the prettiest little coconut macaroons. I love how simple and beautiful these are. Such a delicate sweet treat and great for people with gluten allergies too! These look like perfection! I LOVE anything coconut. I love these photos! Especially the little motor and pestle! So cute... Coconut is one of my weaknesses. Shulie, your macaroons definitely look perfect. I never thought of piping them for those beautiful ridges. Thanks for the tip! I didn't like coconut when I was younger but now I'm crazy for it. Your macaroons and photos are just gorgeous! I love macaroons because they are naturally gluten free! These look delicious and I love your photos capturing their simplicity! These are absolutely beautiful. I love coconut and I love macaroons. Seriously gorgeous photos. You probably didn't know that macaroons are a very favorite treat of mine! I love them and I wish I could try some of yours, Shulie!! יופי של מקרונים הכנת. אני אוהבת, למרות שהמשפחה של החצי מוזרה בעניין הזה - אסור אפילו להזכיר את המילה קוקוס לידם. 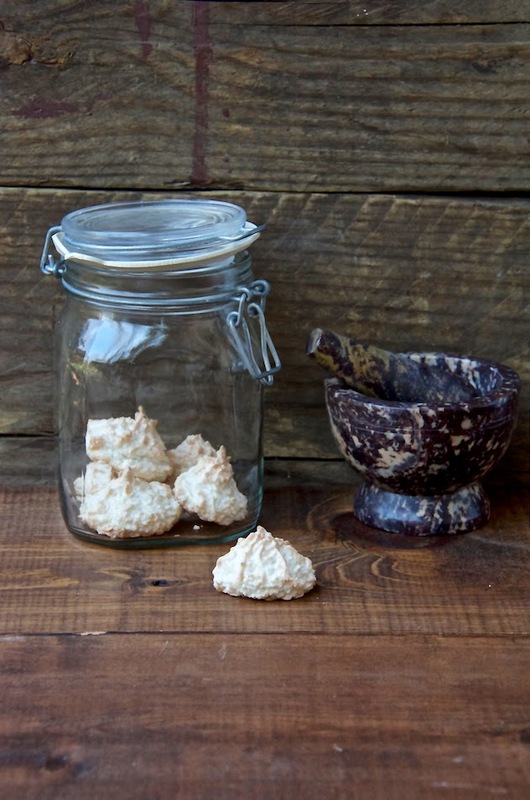 These Coconut Macaroons just look perfect! So pretty too! "Simplicity has to be mastered" indeed! These look lovely, Shulie. Macaroons are a big favorite of mine and yours look incredibly good. I really enjoyed this post for more than the recipe. I learn something with every visit!